Bobcat has the largest list of attachments available in the entire industry today, and every attachment is built to match the supreme performance that your Bobcat machine has been built with. Bobcat genuine attachments are here to transform your machine into a bigger and stronger version of itself, able to power through the toughest jobs while being backed by the best service, support, and parts in the industry. 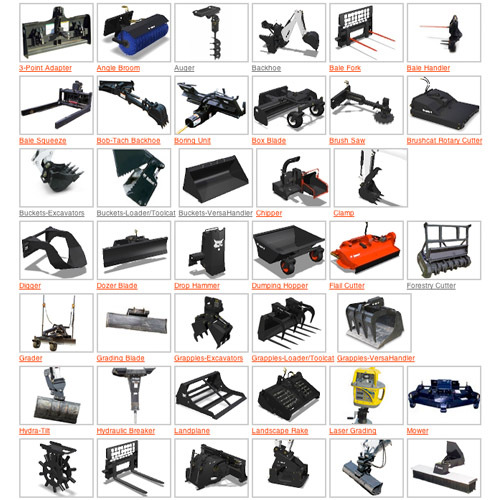 You can find a wide range of high quality, genuine Bobcat attachment parts for your skid-steer and mini track loaders, compact track loaders, mini excavator and telehandlers, utility vehicles, and utility work machines. There are attachments available to help you power through bigger tougher jobs than ever before, or attachments to help you scale down and get through seasonal jobs, everyday work, or occasional work projects with ease. Every Bobcat genuine attachment comes with a one-year extended warranty and the best service and support in the industry. Bobcat has been serving satisfied customers from around the world for more than 50 years, so they understand exactly what you need to get your job done right. Whether you need buckets, fertilizers, and grain loaders for large-scale agricultural jobs, grapples and graders for tough forestry work, diggers and drop hammers for construction, concrete mixers for laying down the groundwork, or angle brooms for cleanup, Bobcat’s got it all and so much more. Search the extensive list of Bobcat attachments and find exactly what you need to power through your next project with ease and reliability. A wide range of attachments is available to view on BOBCAT’s USA Website. Please contact us to check availability in Southern Africa. Click here to view the international range of Attachments.